Aananda, as the name itself suggests, is one of the perfect place to enjoy blissfull vacation with family and friends. It is a 2 star hotel in Haridwar, located at the bank of river Ganga. Enjoy the gorgeous scenery of Shivalik mountain range and the holy Ganges from the roof top of hotel. One can also plan excursion to Rishikesh and Mussoorie as hotel travel desk providing complete assistance. 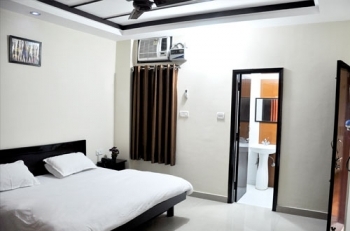 Deluxe stay becomes more comfortable with well furnished rooms, that includes all modern amenities like AC, TV etc. No need to go away for dining as the hotel has a restaurant within it. The hotel is located at Bhopatwala, Haridwar near Durga Fakiri Dham in Shiv nagar, only at a distance of 2 Kms from Har Ki Pauri - Haridwar. The hotel offers you total 25 rooms including 12 well appointed Air Conditioned and 12 Super Deluxe rooms with all modern facilities like AC, TV, elevators etc. Guests can e njoy delicious and purely vegetarian meals at The Magpie multi cuisine restaurant of Ananda Hotel that compels you to eat more and more even after satisfaction of appetite. 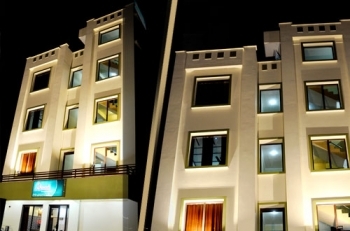 - Well furnished air – conditioned rooms and super deluxe rooms, Multi –channel satellite LCD television, Telephone Phone. - Hot and Cold Running water, 24 hours room service, Taxi available round the clock. By Train: Haridwar has a Railway Station, where many super fast and express trains arrive from major destinations of India. Shatabdi Express from New Delhi, Upasana Express from Howra, Sangam Express from Allahabad, Hemkunt Express from Jammu, Bandra Express from Munbai, Lahori Express from Amritsar etc are some important trains to Haridwar. By Air: Jolly Grant Airport in Dehradun is at a distance of 35 Kms from Haridwar. You can board Daily flights for Dehradun from Delhi. Distance between Airport to Haridwar can be covered by Taxi which is easily avilable from the Airport. By Road: Direct Buses to Haridwar are avilable from Delhi, Rishikesh, Dehradun, Haldwani, Ludhiana, Shimla and many other destinations of Northern India. Another option is to hire a Cab for Haridwar from your city as the road is Motorable.